2 skeins of Gloss in Cocoa. These will become a pair of Baudelaire (for me). 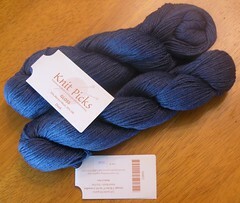 2 skeins of Gloss in Dusk. These will become a pair of Hedera (for me). 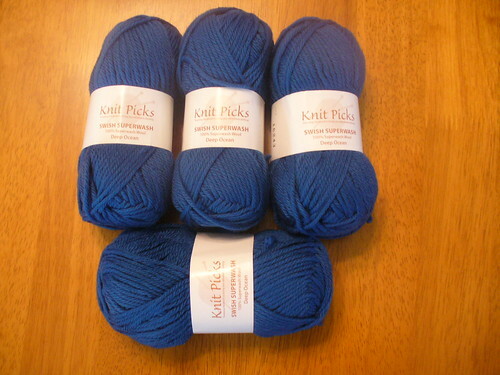 4 skeins of Swish in Deep Ocean. This will become a sweater for Charlie. (See how Deep Ocean goes with the Sea Blue Stripe?) Maybe a Sherwood. 5 skeins of Swish in Dublin. Probably a Sherwood for Max. 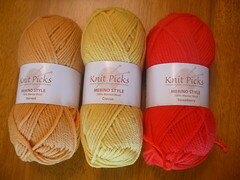 3 skeins of Merino Style in Crocus, Harvest, and Strawberry for a design of my own. It was on sale! 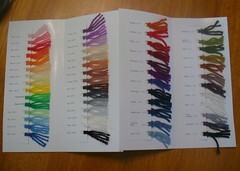 Complimentary color cards. Wow. Telemark and Palette. I already have Palette, but that just means Max gets to play with it. (He’s thrilled.) Mom thought I was crazy when I bought all of those color cards, but when I went to place my order, I knew exactly what the colors looked like. 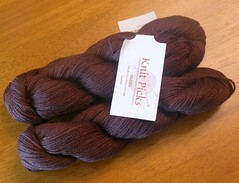 My review: all of these yarns are gorgeous! Both to touch, and their colors. I’ll give better reviews when I use them. 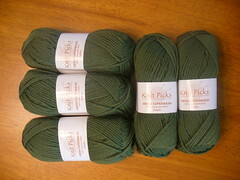 This entry was posted in In Progress, Yarn and Reviews. Hee hee, stocking up before you migrate over the ocean? Mmm…KnitPicks… I love the Merino Style colors! Another stuffed animal, perhaps? Your stuffed animals are too cute.